05th September, 2010, Bhopal, M.P. How I hope, this trend continues for ever and we actually start greeting each other with Happy IT Diwas and it become a IT UTSAV : IT fraternity should make this day, their own. The enthusiasm shown by the Channels in state of Madhya Pradesh has made our will stronger to make the IT Diwas, a celebrative and a repetitive affair. Next year in 2011 we will include Chhattisgarh and make it a bigger & better event, such a event conceived for the first time in the entire Madhya Bharat. SD's No.1 Computer Vendor and Reseller of the Year 2010 in Madhya Pradesh. & Mr. Govind Malu, Spokes person, BJP M.P. to Shri Sudhir Arora & Sumeet Arora of Computer Gallery. SD's No.3 Computer Vendor and Reseller of the Year 2010 in Madhya Pradesh. to Shri Rakesh Agrawal of Pioneer Computers. SD's No.4 Computer Vendor and Reseller of the Year 2010 in Madhya Pradesh. SD's No.5 Computer Vendor and Reseller of the Year 2010 in Madhya Pradesh. SD's No.6 Computer Vendor and Reseller of the Year 2010 in Madhya Pradesh. 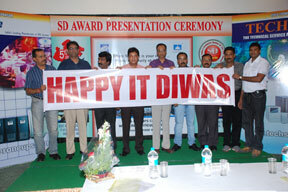 SD's No.8 Computer Vendor and Reseller of the Year 2010 in Madhya Pradesh. to Shri Manish Goyal of Byte Peripheral. SD's No.9 Computer Vendor and Reseller of the Year 2010 in Madhya Pradesh. to Shri Sanjeev Gupta of Veltronics India. SD's No.11 Computer Vendor and Reseller of the Year 2010 in Madhya Pradesh. SD's No.12 Computer Vendor and Reseller of the Year 2010 in Madhya Pradesh. to Shri Pradeep Jain of Pioneer Sales & Services. SD's No.15 Computer Vendor and Reseller of the Year 2010 in Madhya Pradesh. to Shri Ajay Rochlani of Computer Shoppe. SD's No.18 Computer Vendor and Reseller of the Year 2010 in Madhya Pradesh. to Shri Rajesh Babel of Yash Marketing. SD's No.19 Computer Vendor and Reseller of the Year 2010 in Madhya Pradesh. to Shri Sanjay Rawat of Tauras Micro System. SD's No.20 Computer Vendor and Reseller of the Year 2010 in Madhya Pradesh. Zoom View SD's No.1 UPS Vendor of the Year 2010 in Madhya Pradesh. to Shri Pradeep Saxena & his team of Weartech Engineers. Zoom View SD's No.3 UPS Vendor of the Year 2010 in Madhya Pradesh. to Shri Vishal Jain of Technical Systems.